The fridge door beep makes me snap back into reality and I realize I’m doing it again! It’s nearly time for the main meal for the day, and I’m still staring into the abyss that is my fridge – waiting and hoping for some inspiration. “Oh well, I’ll just make “X” again!’”(insert your dish that you keep making more frequently than you’d like to admit…) There I go again; stuck in a cooking-rut. 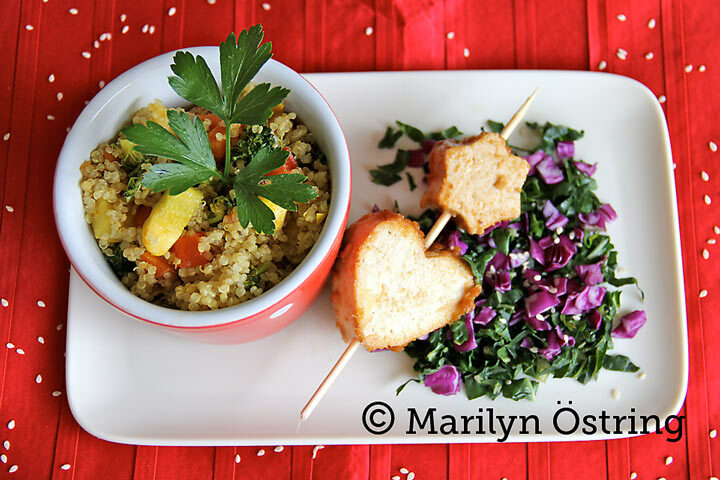 Hi, my name is Marilyn Östring and I’m so excited to be joining Vegalicious as a guest recipe contributor. I live and write from Sydney, Australia, so a big G’day to you all. I’m really looking forward to journeying together and exploring scrumptious, healthy, feel-good snacks, meals and desserts that your whole family can join in with and enjoy. Please scroll down to read my health story. As a busy stay-at-home mom with two preschoolers and other projects to occupy my time and brain-space, I know how challenging it can be to provide nutritious and healthy meals for your family – and then actually trying to get your kids to eat it! I would love to say that my family has it down perfect, but that wouldn’t be entirely true. With a 4 1/2 year-old and a 2 1/2 year-old, it is inevitable that there will be days where it’s a battle. So I’m very much journeying with all you young families out there. But I have learnt a few things on my experimental journey so far that I look forward to sharing with you as we go along. The key thing that I have discovered, is that your meals don’t always have to be something new or lavish to get your family interested. Often simply serving it up with a bit of pizzazz and kid-appeal-creativity, does the trick. Much like todays meal that I want to share with you. 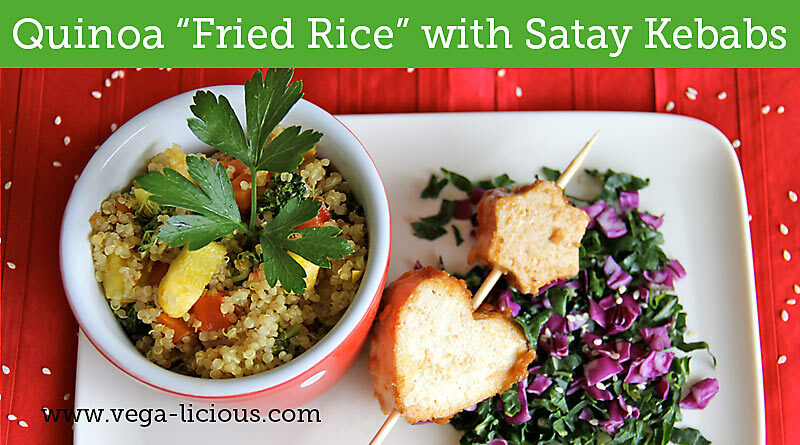 I present… Drum roll… my first recipe for you: Plant Based Quinoa “Fried Rice” with Satay Kebabs. Rich in carbohydrates, with a low glycemic index (great for diabetics). High protein content and provides all essential amino acids. Low in fat, most of which is omega-6 polyunsaturated fat. Notable quantities of the minerals manganese, magnesium, iron, copper, phosphorus and potassium, and vitamin E and B-group vitamins. Grab the recipe and have fun preparing it together as a family! Turn oven on to fan force and 320 F (160 C). Lay a sheet of baking paper on an oven tray. Slice the tofu into 6 equal parts (approximately 1.5cm in thickness). Place the slices flat on a chopping board, and use a small cookie cutter to cut out shapes. I used two small cookie cutters for each slice, which yielded 12 decent sized pieces. Put left-over tofu in a plastic container and set aside for the time-being. Alternatively, you can just cut and cube the tofu. Combine remaining satay ingredients in a small bowl or cup and mix till well combined. Coat each tofu shape in the marinade and put on baking paper. Put in oven till goes a nice golden color (the duration will vary on your oven, but should take approx. 10-15 min). While this is baking, continue on with the next step, below, but keep an eye on the tofu so that it doesn’t burn. Once tofu is done, turn off oven and remove tray. Once cool enough to touch, put two or three pieces on small kebab sticks, and put back in the switched off oven to stay warm. Rinse quinoa in a sieve and put in a pot with the water. Cover the pot with a lid and turn heat to high. Once the water starts to boil, keep an eye on it. Quinoa is cooked when it is soft, all the sprouts are visible and the water has been absorbed (time will vary according to your stove but should be approx. 15 min). Remove from the heat. Fluff with a fork and put lid back on. Set aside for the time-being. While quinoa is cooking, put olive oil in wok or saucepan with a lid (alternatively, for a low fat version, use water for cooking). Start by chopping the onion, carrot and capsicum. Add to wok and mix through. Turn onto medium-high heat and cover with lid. Chop remaining ingredients according to instructions in ingredients (above), and add them to the pan as you go. (NOTE: keep the lid on the wok while cooking to add water from the steam back into the cooking. This means you can sufficiently cook it with the limited oil in this recipe, and it will cook faster too. Depending on your wok/saucepan, you may need to add in a bit more water so it doesn’t stick to bottom. Also, don’t forget to keep an eye on your tofu and quinoa). Once all vegetables have been put in wok/saucepan, add in the turmeric and vegetable stock powder. Mix well and let it cook until all vegetables are cooked through. TO SERVE: Once vegetables are cooked, stir in the cooked quinoa and put in a big serving dish or individual plates. Serve satay-kebabs on a bed of thinly chopped fresh greens and purple cabbage (eg. silverbeet or pak choy) and sprinkle with a splash of lemon juice and sesame seeds. 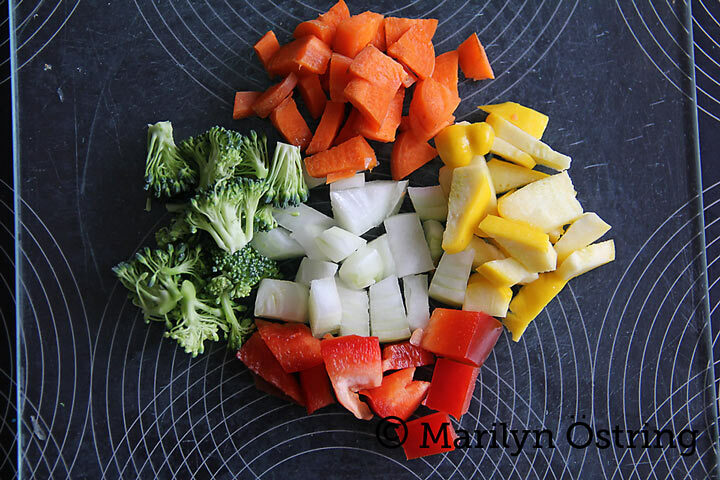 You will save time by chopping as you go along cooking the vegetables. But if you prefer to chop up all the veggies before you start cooking them, that is fine too. This recipe can be made with no oil; just keep adding a little water as you cook the vegetables. Combine and lightly fry any leftover tofu and marinade. It can be used as a burrito or sandwich filling for lunch the next day. 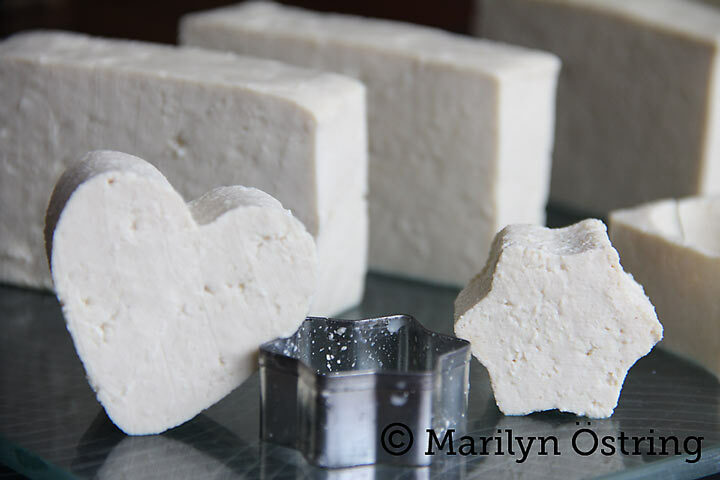 I am very happy to add Marilyn as a regular contributing author on Vegalicious blog. 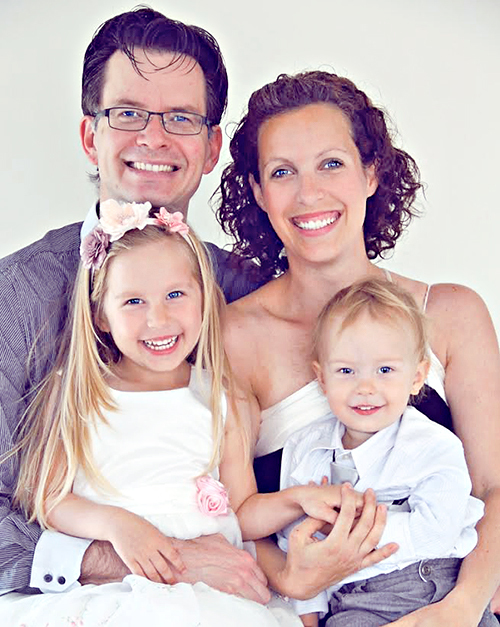 She is a successful plant-based mama of two energetic toddlers and loves living vegaliciously. Marilyn is a qualified Community Health Educator and is a passionate whole-foods-plant-based-foodie at heart. In her spare time she enjoys giving fun and dynamic health talks, cooking demonstrations and cooking classes. She especially has a passion for equipping kids and young families to eat healthy and live a balanced healthy lifestyle, as a means of achieving maximum quality of life throughout their lives. Marilyn is blessed with a wonderful hubby and amazing kids! 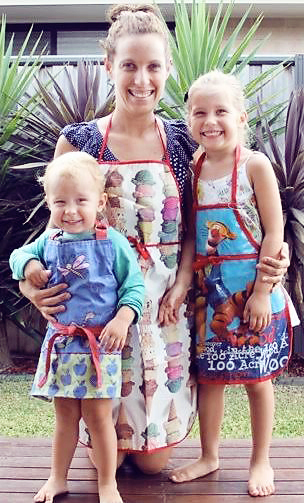 She loves cooking with her kids. 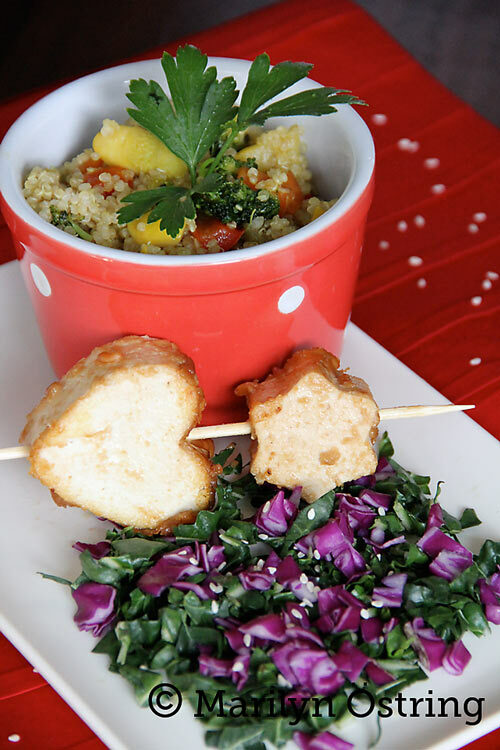 They have loads of fun whipping up lots of delicious, healthy meals and snacks. I am thrilled that she will be sharing some of them with Vegalicious audience! Here is Marilyn’s amazing healing story and the reason she eats a whole foods, plant based diet. My parents are from Serbia, so I grew up with a predominantly Mediterranean-style diet which included meat, lots of milk products and eggs. It wasn’t until I was old enough to understand that meat was from animals, that I started to think about my diet, but there was little that I could do at that stage since my diet was still largely controlled by my parents. It wasn’t until I was 17 and started looking into nutrition for myself, that I began my health exploration journey that has led me to where I am today. A few years later I found out that I was lactose intolerant, which was a hard-hit for me as an avid milk and cheese lover! I was a vegetarian for many years and had switched to no milk products, but continued to indulge my sweet-tooth with unhealthy treats and was constantly emotionally eating. It didn’t take long for me to start putting on weight and have problems with reflux, IBS, bad skin and tiredness to just name a few of the problems. As a result I had a terrible self-image and was constantly weighed down with guilt about my food choices, on top of already not feeling the best physically. In 2007 I got married to my hubby who had been brought up as a vegetarian. Soon after we were married, we ended up at a nutrition seminar where we learnt about the benefits of a whole foods plant-based diet for optimizing health, fighting disease, longevity, and its positive impacts on the environment. We started researching more and eventually were undeniably convinced by the weight of evidence in support of a plant-based diet. Since moving to a balanced plant-based lifestyle consisting of whole foods, eliminating refined sugar and other processed products and additives in our food, I have lost the excess weight, have more energy, my skin has cleared up, and no more reflux or IBS issues. I have also learnt tools to help me satisfy my cravings in a healthy guilt-free way and I feel FANTASTIC as a result! My body now naturally maintains a healthy weight, whereas before it was always such a struggle. As always, enjoy making this kid and family friendly recipe, and please be sure to share it with others on the web, through email, and by sharing what you make with others! And drop a note in the comment section to welcome Marilyn to Vegalicious family!